West Malpais Wilderness is 39,400 acres in west central New Mexico that has seen probably three million years of volcanic eruptions, and all the cinder and spatter cones, craters, lava tubes, pressure ridges and ice caves that go hand in hand with that kind of geological activity. 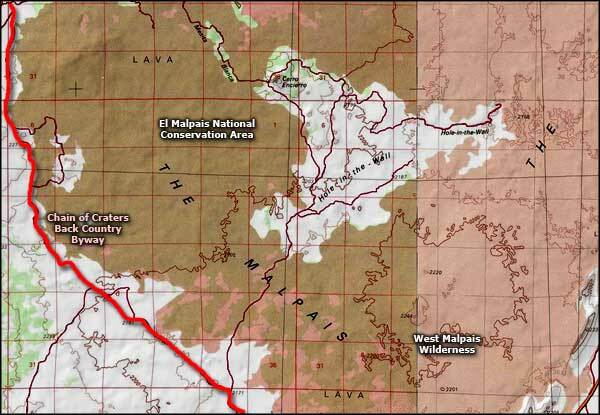 The West Malpais Wilderness lies in the western part of the El Malpais National Conservation Area, adjacent to the El Malpais National Monument. The Cebolla Wilderness is on the eastern side of the Conservation Area. In the heart of West Malpais Wilderness is an area called "Hole-in-the-Wall," an island-like depression in the lava fields that has collected enough moisture and wind-blown soil over the millenia to be able to support a 6,700-acre park filled with Ponderosa pines. 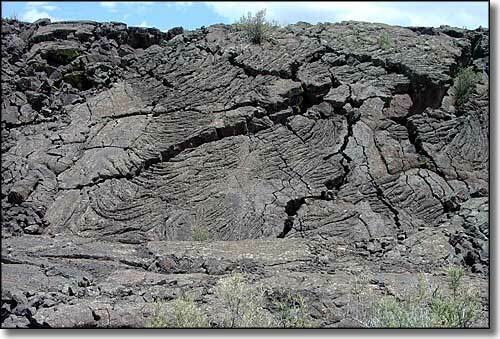 The lava underlying the area is about 700,000 years old, while the lava that created the raised barrier around the depression is much more recent. The Hawaiians would call this area "kipuka," meaning "island of fertile ground" (around the world, nearly all of the terms used to describe anything to do with lava and lava formations are Hawaiian in origin). Hardened lava is very rough, very sharp, very abrasive. For hiking around here you'll want good balance and some really good shoes. The trails are marked by small rock cairns placed strategically among the clumps, folds and falls of lava. And you'll want some flashlights and solid protective clothing if you're into exploring the lava tubes. Any water that you find here will be water that you brought with you. To get there: follow the directions to the Chain of Craters Back Country Byway. The Byway forms the western boundary of the West Malpais Wilderness. As this area is designated wilderness, no motorized or mechanized vehicles (including mountain bikes) are allowed off the road. Lava falls photo courtesy of the National Park Service. 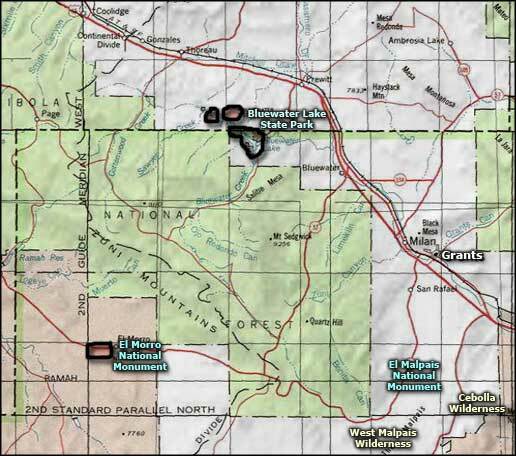 Map courtesy of the Bureau of Land Management.